Spring has finally sprung! At least that’s the feeling I get every year when the Masters Tournament begins. No matter how cold it is outside just watching the PGA Tour hitting the tees at Augusta makes me feel like winter is finally over. 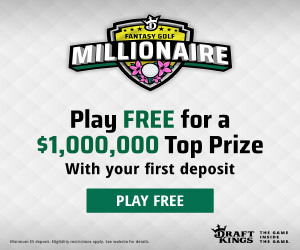 Even though you’ve probably been playing fantasy golf games since the season began at the end of 2017 for some true fantasy players, games don’t start until the 1st major of the season pops up on the DFS calendar. This year is tough because every guy below is a favorite to win and I could easily slot any one of them into my final pick to win the Masters. I guess this year we could be in for one of the best tournaments if all the golfers below make a charge on the leaderboard. These picks are building blocks to use for your Fantasy Golf Millionaire lineups at our partner fantasy site DK. Bear in mind they are the highest price golfers and you will need some of our sleeper picks for the Masters if you plan on building a lineup around 1 or 2 of these guys. Two months ago, Tiger wasn’t even considered for any of the pages we wrote. About a month ago he became a consideration for the Sleeper Picks page. Now, given his history at Augusta, how can you not look at Tiger Woods as possibly winning the Masters? For gamblers Tiger has even become a betting odds favorite to win the Masters. He’s won 5 times at Augusta and although his golf game has some holes in it he walks into the tournament confident in his past history to play well. It would be a great story for Tiger Woods to win at the Masters again in 2018 and even though I don’t think he will…I may just have to put him into a few lineups. He is a favorite pick of mine to use at Augusta because he just seems to play the course well. In all four of his trips there he’s been in contention to win and has won once. Spieth isn’t a top favorite to win this week but that just means that his ownership numbers will be lower and give you a better shot at winning with him. Until he hurt his back last year DJ was the pick to win last year for everyone. He is the #1 golfer in the world and is still playing some of his best golf ever. I worry that he hasn’t played as much golf leading up to the Masters Tournament but he should still be a solid pick to win this year regardless. He didn’t play really well at the WGC Dell Technologies Match Play tournament but that also isn’t the best indicator. Thomas is also playing lights out in 2018 with two wins and a second place finish. He is the world’s #2 ranked golfer and he will be looked at this week as one of the heavy favorites to win. He should do well for your fantasy golf lineups as he looks to improve on last year’s 22nd place finish. Finished top 4 at the WGC so his game is still clicking. Some of these Picks are chosen from our partner Golfstats.com. 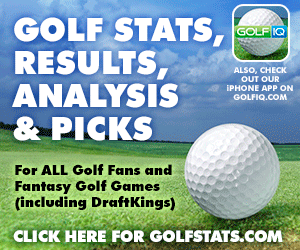 They are the best fantasy golf stats and information online. If you play fantasy golf, you have to check out their site for the Masters - Golfstats.com. Day seems to have put his health issues behind him and all his personal stuff seems to be gone too. Day has a good history at Augusta and will look to try to add a green jacket to his career accomplishments. Not a bad salary cap price at $9,800 for the Fantasy Golf Millionaire and can easily win this week if he plays the way he’s played so far in 2018. So when I wrote the Masters Fantasy Picks article it was before the WGC Dell Technologies Match Play tournament where Bubba Watson came out and won. I also wrote on that page that Bubba Watson will probably have low ownership – All that has changed a bit! Watson’s betting odds to win the Masters have dropped to a favorites level, his ownership in fantasy golf lineups will probably much higher because of this win and given that he is a lefty and they do have an advantage playing at Augusta…could Bubba be looking at a 3rd green jacket for his closet? Rose has come close to winning the Masters a few times and skipped the WGC Match Play because he wanted to set his attention on the Masters. He played at the Houston Open which is a similar style course to Augusta to practice up for the big tourney. Even if Rose shows poorly at the Houston Open don't worry, for some they use it as a tune up and aren’t sad to skip the weekend knowing that the main event is coming. Rose has nothing left to prove on the PGA Tour and won’t be looked at as a top favorite to win but he has his sights on winning before his career is over and he comes into the 2018 tournament much the same way that Sergio came in last year…before he won his first Masters.